Leading Authorized Wholesale Dealer of spur gear chain pulley block, triple spur gear chain pulley block, chain pulley block, gear chain pulley block and chain pulley blocks from Hyderabad. Production Capacity: 0.5TON X 3Mtrs Height of Lift. Packaging Details: Extra, and other taxes Extra as applicable. Precisely engineered by reputed vendors, the offered Triple Spur Gear Chain Pulley Block has always been one of the best choices in the market. 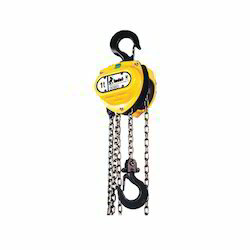 Made available to clients at the best price possible, the pulley offered is highly praised and preferred. 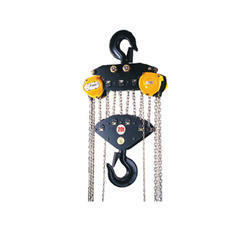 Owing its high ability to bear load, the offered pulley is highly used in various construction and logistics industry. 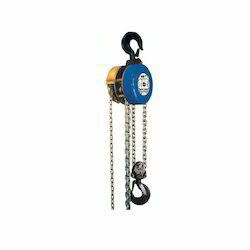 Impeccably designed to provide maximum satisfaction to our clients, the offered Chain Pulley Block manufactured by reliable vendors are one of the finest available. Owing to the raw materials used, the offered products are highly resistant to corrosion and have a long life. Further, the product’s unnatural load bearing capacity is highly acclaimed. Manufactured in accordance with the set industrial norms, the standard of this Gear Chain Pulley Block is always maintained. Owing to our trusted vendors, the offered product is highly sturdy, durable, impeccable functioning and has a high resistance to corrosion. In addition, we provide this pulley at a very reasonable price. We are a trustyworthy organization offering a wide a gamut of Triple Spur Gear Chain Pulley Block. We are the only leading supplier who deals with the Chain Pulley Blocks. 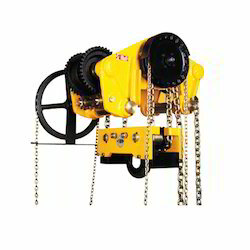 Chain Pulley Block are available in various types such as Hook Suspension Type, Push-Pull Trolley Type and Hand Geared Trolley Type and possess a load chain. This load chain used is fabricated using 80 grade alloy steel chain where as the hand chain is calibrated with Mild Steel. Looking for Pulley Blocks ?